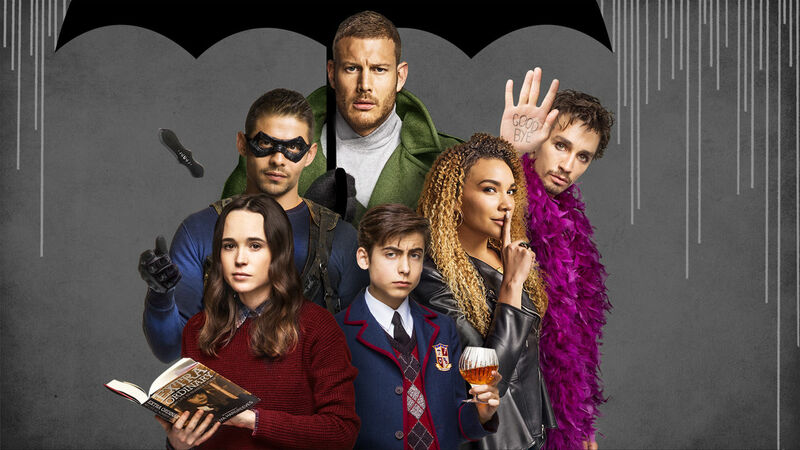 This hot mess superhero drama is quickly becoming one of the most talked about Netflix original TV shows of 2019. Here's why. One: AKA Luther. Super strength. Two: AKA Diego. Can manipulate anything he throws, favoring knives. Three: AKA Allison. Can make anything come true by saying "I heard a rumor . . ."
Four: Klaus. Can see and speak to the dead. Six: AKA Ben. A monster comes out of his chest. Seven: AKA Vanya. Dud, no powers. Their mission? Save the world from an impending apocalypse that is going to happen in 8 days. Their Problem? Too many to count, which makes watching this rag tag band of flawed superheroes that much more fun as they try to right wrongs and ultimately save humankind. By the end of season 1, you'll have more questions than you started with, so plan on staying on the edge of your seat until 2020 when season 2 comes out. What are you still doing here? Start binging!